The mobile user experience best practices (UX) can be defined as providing the mobile users with design and function related features which suit their needs and expectations in the platform they use to enter the web. To this end, it is a good idea for the app owners to mind a few points such as screen area, user’s attention span, and user interface design. Sometimes, user experience does not get due attention in the creation of an app, and this causes a degradation in the long run for its usage. That is because the mobile users prefer to spend more time in apps that constantly update and improve for a better user experience in order to suit to the changing expectations of the users. Read more about how to build app without coding free. So what are the mistakes to avoid for ensuring that the mobile users will keep your app in their devices for a long time? For the persons and organizations, that desire to have a mobile app, following the path taken by the successful apps that exist on app markets may be one of the first methods that come to mind. However, it should not be overlooked that not every app target the same target audience, and hence doesn’t offer the same value proposition. On the other hand, it is beneficial to be different for creating a competitive advantage among the mobile apps in similar categories. To this end, focusing on the expectations of people who you expect will use your mobile app, and create solutions towards these needs can be useful for your app. It is highly important for the mobile apps to get improved and updated according to changing needs of the users. However, it should not be overlooked that, if the updated version has a large file size, it may lead to increased duration of updating and may cause inconvenience for the mobile users. A mobile user may not find what they are looking for in the app, or they may experience difficulties with it. What is important here, is ensuring that they can find someone to communicate with. This way, you can both have a better idea of the user expectations, and also increase the user satisfaction. Focusing on more than one function instead of offering a solution to a need of your target audience will have a negative impact on user experience. Because this will mean highly different features will need to be included, and this, in turn, can lead to getting distracted from the app’s main feature. Instead of trying to satisfy all the needs of the users, focusing on a single one that will make their lives easier can lead to an improvement in the user loyalty. 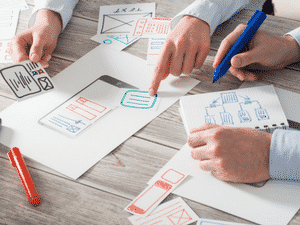 As the user experience is a concept that requires constant improvement, responding to user expectations in a timely manner is of great benefit. However, if you do not yet have a mobile app, you can have one in a few minutes by creating a MobiRoller account.